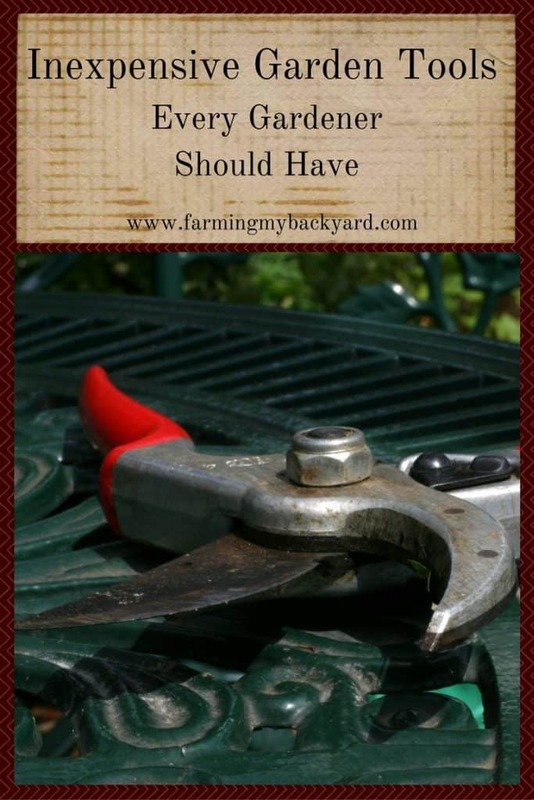 If you are getting started with homesteading or growing your own food you may think you need to run out and buy a lot of new tools to get started. Anything we buy takes our time and money in it’s purchase price and in the cost to store and maintain it. You may think you need a bunch of large equipment such as tractors and rototillers to homestead, but the truth is, you don’t! Even if you have a small lot in the city you can grow a lot of food with only a few garden tools. I enjoy gardening but I also enjoy living simply without a lot of clutter. I have found that a few tools have been indispensable in the garden. I use my shovel for preparing beds, planting trees, shoveling snow, turning my compost, spreading compost, and cleaning up after the chickens, goats, and dog. I wouldn’t know what to do without it! It’s a digging shovel, similar to this one. A leaf rake is great for, of course, leaves. During the rest of the year use it to spread straw in the animal pen or mulch around the garden. I use these for trimming trees and bushes, taking plant clippings and breaking up larger sticks to go in the compost. I find buckets to be the most versatile tool. I plant in them and have had a vermiculture bin in them. They also carry soil, weeds, mulches, compost, and water and can go anywhere even in very small spaces or around tight corners, unlike many wheelbarrows. If you have extra you can use them to hold feed mixes, or as goat or chicken waterers. Many times you can get these for free, but they are also pretty cheap on Amazon if you are having a hard time finding them. And of course garden hoses are wonderful tools. The garden really suffered during some seasons when I didn’t have enough hoses and couldn’t reach to half of my yard. You can do quite a bit of watering with a bucket, but having garden hoses for watering really saves your back and makes it go much faster! It doesn’t take many tools to get started with a successful garden. Even if you don’t have a lot of land, or a lot of storage space you can still have a productive garden and homestead.